Honestly, I can’t even begin to tell you how much I feel this quote is relevant to my life right now as a whole really. Let’s digest shall we? I am a being of assumption. It’s a bad trait that i’ve had for a long time that seems to pop up every now and then and just always bites me in the arse. To put it in to context, if you think something is “going on“, whether that be between two of your friends or between yourself and a friend, do not assume, just ask! Trust me, it’ll save you a lot of hassle, time and worrying. Do more! It’s summer, which means it’s time to get out there and enjoy yourself! If you’re a student and you’re on summer holiday’s, make the most of it! Don’t spend your entire summer sitting at the laptop looking at tumblr pictures of people having fun, make your own memories! You don’t need to have a lot of money to have a great summer. I’ve never really had a lot of money and I always make sure I have an amazing summer. For example, inviting friends over(byob of course 😉 ), beach nights, camping, getting crafty with items you already have readily available at home, seriously Google that, the possibilities are endless! There are so many things you can do this summer, so get out and do them! Needing less. This is something I think i’ll have to write a whole separate post for, but for now, just think, do you really “need” that new eyebrow palette just because “everyone” else has it? Do you really “need” to go to that show in that horrible little pub, just because “everyone” else is going? You shouldn’t need to do things that other’s wish to do for yourself to be happy, do what you want to do because you want to do it. Always remember to smile, at everyone! You never know, you might just turn someone’s day around. Everyone has dreams right? I know I certainly do and they grow bigger every single day. If you have a dream, follow it, pursue it, because if you don’t, one day you’ll really regret that you never took the chance to. Laughing is the greatest medicine, it really is. Surround yourself with people who make you happy. 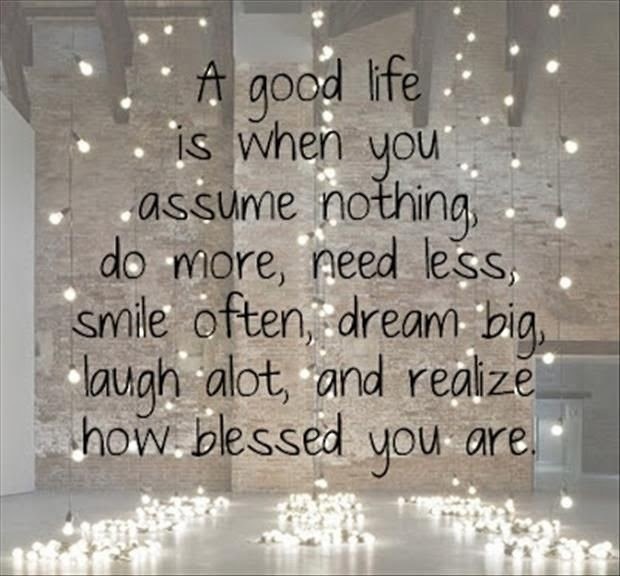 Always, always remember how blessed you are. If you’re reading this, you are alive, you are breathing, you are lucky enough to be on this planet, you have a roof over your head and food in the fridge. You are more blessed than others in this world could even dream of. Sorry for such a “rambly” post! What are your thoughts on this quote? I hope everyone’s Monday’s gotten off to a great start! Thankyou for sending me your link in the #bloggersdoitbetter chat.